If your worksheet contains threaded comments or notes, you can print them. Note: In Excel for Office 365, there are two kinds of comments to choose from: threaded comments and notes. For more information, see the article Threaded comments and notes. To display an individual comment, right-click on the cell, and select Show/Hide Comments. To display all comments in the worksheet, go to the Review tab > Show all Comments. To move or resize any overlapping comments, click the border of the comment box so that its sizing handles appear. You can resize the comment box by dragging any of its sizing handles, or move it by selecting any part of its border, then drag it where you want. On the Page Layout tab, in the Page Setup group, click the flyout on the right to launch the Page Setup dialog. In the Comments box, choose either At end of sheet or As displayed on sheet. Click Print, or Print Preview to see a preview of the comments. Select the worksheet that contains the threaded comments and notes that you want to print. In the Comments box, click At end of sheet. Note: In Excel for Office 365, you can't print threaded comments as they're displayed on a worksheet, but you can print notes. See the next section on printing notes in Excel for Office 365. Click Print, or Print Preview to see a preview of the comments and the notes. You can print notes the way they appear on the sheet. 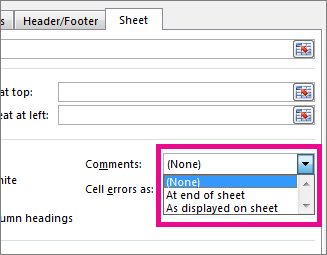 To display an individual note, right-click the cell and click Show/Hide Note. To display all notes, go to the Review tab > Notes > Show All Notes. To move or resize any overlapping notes, click the border of the note box so that its sizing handles appear. You can resize the note by dragging any of its sizing handles, or move it by selecting any part of its border, then drag it where you want. On the Page Layout tab, in the Page Setup group, click the flyout on the right to open the Page Setup dialog box. In the Comments box, click As displayed on sheet (legacy). Note: In Excel for Office 365, you can't print just notes at the end of the sheet. However, you can print both threaded comments and notes at the end of the sheet. See the previous section on printing threaded comments and notes in Excel for Office 365. Click Print, or Print Preview to see a preview of the notes. To display an individual comment, right-click on the cell right-click the cell and select Show/Hide Comments. To move or resize any overlapping comments, right-click and select Edit Comment, and the border of the comment box will display sizing handles. You can resize a comment by dragging any of its sizing handles, or move it by selecting any of its borders, then drag it where you want . Note: In Excel for Office 365 for Mac, you can't print threaded comments as they're displayed on a sheet. But you can print notes as they're displayed on a sheet. See the next section on printing only notes in Excel for Office 365 for Mac. To move and resize any overlapping notes, right-click and select Edit Note, and the border of the note box will display sizing handles. You can resize a note box by dragging any of its sizing handles, or move it by selecting any of its borders, then drag it where you want . Note: In Excel for Office 365 for Mac, you can't print just notes at the end of a sheet. However, you can print both threaded comments and notes at the end of a sheet. See the previous section on printing threaded comments and notes in Excel for Office 365 for Mac.